"This book fills a very important gap in the mindset of the bond structurer and the investor. Often, the two disciplines approach their tasks ignorant of the perspectives of the other side. But successful structuring requires providing the best value to investors in order to compete, and investors who don’t fully understand structuring will not remain investors for long. Highly recommended!" Bennett W. Golub, Managing Director, BlackRock, Inc.
"An excellent primer on asset securitization, clearly written in plain English and with straightforward mathematical expressions. This book is suitable for both business school students and structured finance market practitioners." 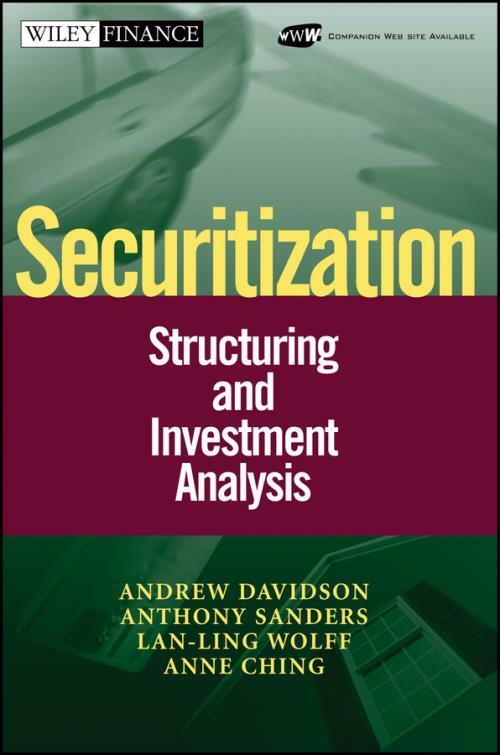 "In their new work Securitization: Structuring and Investment Analysis, Andrew Davidson et al. reinforce their preeminence in the alchemy of mortgage securitization. Anyone involved in mortgages neglects Andy’s work at his peril." "This book provides an insightful and accessible exploration of securitized real estate markets. As such, it provides a valuable service to those active and interested in these burgeoning markets. The authors have done a wonderful job of gracefully integrating a vast and important subject matter. Accordingly, this book also makes for an excellent textbook for those universities offering one or more courses in this rapidly growing field."